The survey was based on a voluntary participation open to all engineering institutes which had completed 10 years as on 31 August 2012 and offered at least three out of shortlisted six streams of engineering. The study saw participation by 156 AICTE approved engineering institutes across eight AICTE zones in India. Following is the region-wise distribution of institutes which participated in the survey; along with the total number of eligible institutes in each state/zone. The institutes under the study offer various disciplines including Electronics & Communication Engineering, Electrical Engineering, Mechanical Engineering, Chemical Engineering, Civil Engineering, and Computers & IT Engineering. 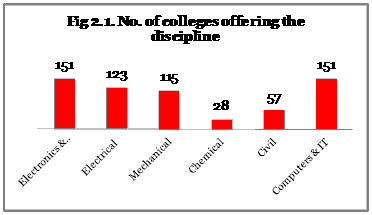 Fig 2.1 shows the coverage of various disciplines across the institutes covered under the study. The selection criterion and the methodology adopted for evaluation is mentioned below. The survey was conducted online through login by institutes into AICTE portal using their AICTE ID. Structured questions and evaluation parameters were designed across each of the dimensions mentioned above and respondents were asked to provide answers to the questions during the survey. The table below shows the evaluation parameters against each dimension. The survey was open for three months i.e. from 7th June to 7th September, 2012. Over 300 applications were created on the portal and final submission was made by 156 institutes. An Objective Evaluation was conducted based on computer generated results and a five-member jury did the first round of evaluation and shortlisting. The average composite score at national level is 30.9. Minimum and maximum scores obtained by the institutes under study are 4.4 and 75.7, respectively. Scores obtained by the institutes under the study are presented in Annexure 4.2. The institutes have been classified on three levels (High, Medium, and Low) of the scores based on the performance assessment scores obtained by the institutes mapped to a normal distribution curve. More than 70% of the institutes have amended 10 or more of their courses after inputs from industry since 2007. In a normal distribution graph 68% of scores obtained are within one standard deviation (σ) from the mean; 96% of the scores lie within two standard deviation; and about 99.7% are within three standard deviation. The mean and the standard deviation in this case is 64.9 and 9.24. We have segmented the sustainability index using intervals of standard deviation into high, moderate and low categories representing 16%, 68% and 16% of the survey population.